My husband and I had a pug as our first dog, so we’ve always had a soft spot for them. They fall into the category of “so ugly they’re cute”. It’s been nearly 20 years and we still miss AJ. We’re celebrating our second year in business at Berger Audiology and wanted to take this opportunity to thank everyone that has wished us well and helped us along the way. 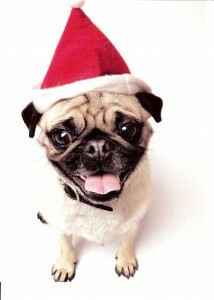 Here’s hoping Santa Pug is good to you this year! And if you notice you’re having to ask for things to be repeated at the Christmas gathering at your house… Give us a call after the holidays and we’ll set you up with a free trial! This entry was posted in Humor by admin. Bookmark the permalink.